If you’ve been following my reflections on the Book of Daniel, you will know that the first four chapters of the book focus on the reign of the Babylonian king Nebuchadnezzar, who laid siege to and later destroyed the city of Jerusalem, including the Temple, and then carted off a portion of the populace into exile in Babylon. Along with people, we’re told that the Babylonian king took the sacred vessels (the gold and silver wares) back to Babylon, where he put them in storage. As the exile set in, we watched as a young exile named Daniel (Belteshazzar) and his three friends rose to prominence in the Babylonian kingdom, apparently due to their faithfulness to the God of Israel—and in Daniel’s case, an ability (like Joseph in Genesis) to interpret dreams. In each of the four prior chapters, the sovereignty of the God of Israel has been demonstrated, and while the king may start out disbelieving, by the end of the chapter, Nebuchadnezzar will have embraced the God of Israel, recognizing the God of the exiles as being superior to his own gods. We have acknowledged that much if not all the story is fictionalized. We’ve noted that there are parallels in chapter four to the reign of Nabonidus, a later Babylonian ruler, though the author uses Nebuchadnezzar’s name instead. After all, it’s Nebuchadnezzar who razed the Temple and took the people into exile. It’s Nebuchadnezzar’s name that the people remember, not that of Nabonidus. In chapter five we jump ahead to the closing moments of the Babylonian kingdom. Nebuchadnezzar is dead. A new king has arisen, who doesn’t seem to know Daniel. In this chapter we learn that this new king failed to learn the lessons of his “father” Nebuchadnezzar (although his actual father was Nabonidus, in this story Nabonidus is replaced with Nebuchadnezzar). As he drowns his concerns in wine, Belshazzar comes up with a rather brazen idea. Why not bring out the sacred vessels Nebuchadnezzar took from the Temple. Why allow them gather dust when they could be better used as conversation starters for his party. While they were at it, they could use the cups to toast their gods, who must be more powerful than the God of a nation like Judah. Nebuchadnezzar had taken the vessels, but he chose not to use they. Instead, he hid them away rather than treat them with disrespect. Not so with Belshazzar. Why honor items sacred to god unable to protect the people of God? They might be sacred to a group of exiles, who are more hostages than refugees. 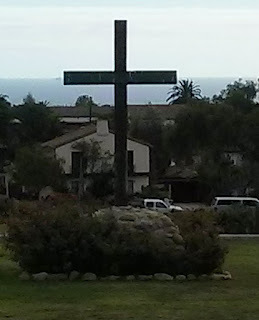 So, now that which represented the God of Israel, would now be desecrated. 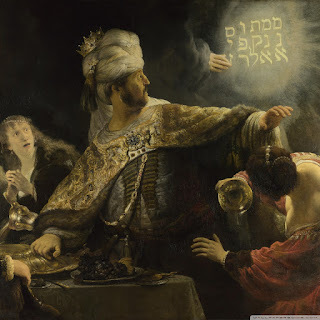 Belshazzar’s act of desecration brings a response from the God who was connected to the now desecrated vessels. A hand appeared and began writing on the wall (you know the proverbial “writing on the wall.”). Belshazzar grew frightened. In fact, he was so terrified that he grew pale, and possibly released the contents of his bowels. The writer uses euphemisms here, but you get the point. I’d be more direct, but it is not within me to do so! I think you know what I mean. He’s frightened! Like Nebuchadnezzar before him, Belshazzar calls for the religious leaders, asking them to interpret this omen. As one should expect by now, these persons cannot fulfill their king’s request. So, you know who is its who gets called? Yes, it’s Daniel. But the invite doesn’t come because Belshazzar remembers Daniel. He gets invited because of the intervention of the Queen Mother (the Queen is mentioned, but a queen would never have this kind of access. A Queen Mother (probably the mother of Nabonidus) on the other hand would have greater power than a consort, and it is clear that she invests herself in the situation. Hearing the discussion about the writing on the wall, she enters the hall, and suggests that Belshazzar ask Daniel, whom Nebuchadnezzar had made chief of the magicians, and a person endowed with the spirit of the holy God(s), a person who has proven himself able to interpret such things. Why not call him in? By now Belshazzar is at his wits end. Having gotten nothing from his regular advisors, why not call forth this person from a previous era, whom his “father” or ancestor had trusted with such situations. We might wonder why Daniel hadn’t been invited in in the first place, but maybe this is the product of a royal housecleaning. In any case, Daniel is brought in. Having been in similar situations before, Daniel is not intimidated by this ruler, who is not even close in stature to Nebuchadnezzar. This king is a bit like Romulus Augustulus, the last western Roman emperor. He has the title but not the power. But the king puffs himself up, addressing Daniel as one of the Judean exiles, not as a person of high rank in the kingdom. He does take note of his prowess as a dream interpreter, repeating what the Queen Mother had told him. A promise of promotion is given as well in exchange for an interpretation. He might be a weak king, but he’s still arrogant (after all, “it’s good to be the king”). I picture Daniel looking the king in the eye (something no mere exile would dare do, but a prophet will), and rejects the offers. He’ll give an interpretation, but he won’t let it be tainted by royal gifts. Daniel begins by reminding him of what happened to Nebuchadnezzar, how he had acted arrogantly, and ended up living in the wilderness like an animal, eating grass. But the great Nebuchadnezzar learned his lesson and pledged allegiance to the God of Israel. Unfortunately, Belshazzar didn’t learn that lesson. He continued to act arrogantly, even to the point of using sacred vessels in a game of desecration, using the cups to pledge allegiance to false gods, that is, idols made of earthly elements. He suggests that Belshazzar should have known the story of Nebuchadnezzar’s humiliation and have learned from it. But, he didn’t. No, he refused to humble himself. Now he would pay a price. So, what is the meaning of the handwriting on the wall, which was written by the hand of God? The words have monetary value. They involve counting. Mene, Mene, Tekel, Parsin. The words are Aramaic. Mene (mina is the equivalent of a talent or sixty shekels) means God has numbered the days of Belshazzar’s kingdom and is brining it to an end. It’s not good news. The second word, Tekel is the equivalent of one shekel, and suggests that Belshazzar had been weighed and found wanting. Finally, parsin, the singular of peres is, in monetary terms, a half-mina or thirty shekels). But more importantly peres is the root prs, which means divide. The word parsin symbolizes that his kingdom will be divided between the Medes and Persians. The news is not good. Belshazzar has every right to be terrified. His kingdom will have an end. In fact, the end is near. So, how does Belshazzar respond? He promotes Daniel, despite Daniel’s resistance. He is made number three in the kingdom, a position he will later hold in the Persian Empire. Despite the warning, despite the terror, the arrogance remains. While he does seem to acknowledge Daniel’s message by promoting him, there’s no sign that he learned anything from his “father’s” experience. There’s no humbling of himself. No acknowledgment of the power of Daniel’s God. He seems to accept his fate, but he’s not going to change. The chapter ends just that way. Before the night is out, Belshazzar will be dead. The empire will have collapsed. Stepping into the gap is Darius the Mede, an unknown personage, but Daniel’s foil in chapter 6. History suggests that the Babylonian empire fell to Cyrus, whom Isaiah portrays as Israel’s savior. Whatever the case, as C.L. Seow concludes: “The narrator’s point, subtly made, is that God’s will is being worked out in history after all” [Daniel, p. 84]. There is one more court tale to explore before the apocalyptic visions begin to take up our attention. To this point the message seems to be that despite appearances (exile), the God of Israel is sovereign. With that in mind, one should acknowledge that truth by walking humbly before God. This is true whether you are servant or king. In fact, it is especially true for kings, who tend to act arrogantly. While these stories we’ve read to this point may have emerged prior to the rise of Antiochus IV, they would have resonated with a Jewish populace that lived under duress. Empires rise and fall. This one will fall as well. But, God will continue to reign. Yes, God will continue to reign. Maybe Belshazzar’s seeming non-response is a recognition of this truth. Why fight it. Give Daniel what was promised and ride off into the sunset. Let another empire rise. They too may fall (and indeed they did, as did its successor, and on and on it goes).